The first postwar Romulan cruiser design was the CATARACT class, which entered service in 2175. Although its pedunculated twin nacelles and winged plan-form are similar to the preceding CLAVICLE class, the CATARACT design had a lower-draft, simpler, rounded shape. 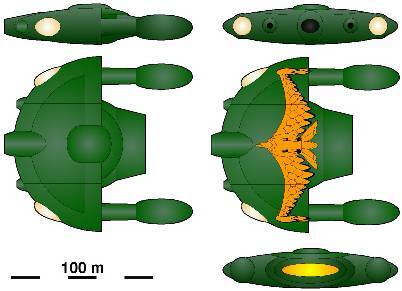 The lower draft of the engineering section reflects the use of a toroidal tokomak-type fusion reactor instead of the spherical reactors used in previous Romulan designs. The impulse drive unit also became a flattened deck similar to that of early Starfleet vessels. Weaponry included a single plasma cannon mounted in a large housing at the midline and fusion-tipped missiles fired from twin projectors. CATARACT was the first Romulan ship to exhibit a central, dorsal bridge module.